Growing up, my parents would incorporate seafood every week for dinner. Usually my mom would serve up fish and shrimp since that was easy to come by and easy on the budget. Every now and then, she'd make something with mussels and that was always a special treat. There's something about picking up an opened mussel, using the shell as a spoon to scoop up some broth and then eating the actual mussel. Those memories came back to me when I recently scored a good deal on fresh mussels at the store. It's been awhile since I've cooked with them and came across this recipe from Cooking Light. Even on a weeknight after a day of work and a toddler tugging at my apron, this recipe came together pretty quickly. It's perfect for an everyday meal and elegant enough for a dinner party with guests. 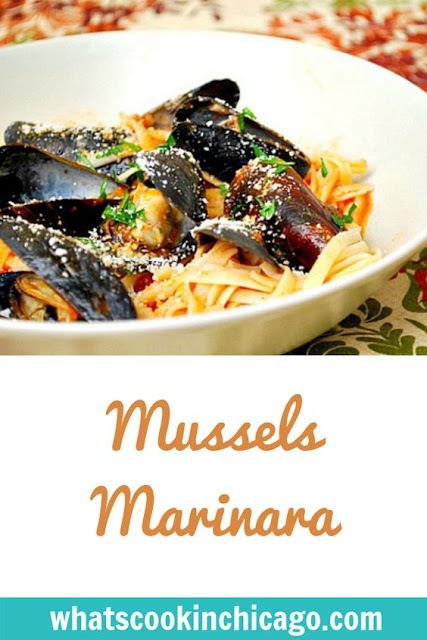 For me, the pan sauce really ties the mussels and pasta together. And if you don't have mussels readily available, feel free to substitute it with shrimp! Cook linguine according to package directions; drain and set aside. Heat oil in a large stockpot over medium-high heat. Add onion and garlic; sauté until softened and fragrant. Add tomato, wine, fresh herbs, salt, pepper, red pepper and bay leaves; cook over medium heat 5 minutes. Add mussels; cover and cook 10 minutes or until mussels open. Discard bay leaves and any unopened shells. Transfer pasta in serving dish. 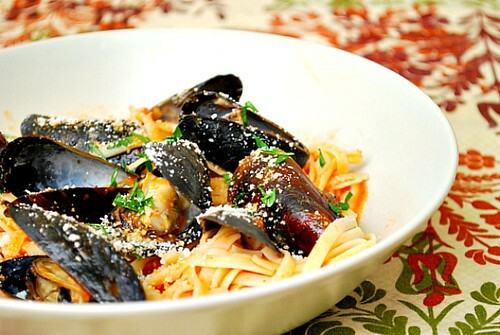 Remove mussels with a slotted spoon, and place mussels over pasta. Spoon tomato mixture over mussels. Garnish with basil sprigs and/or cheese, if desired, and serve hot. This dish sounds wonderful and your picture is so pretty!